Figure 1. Dark Cloud Cover pattern. This article is devoted to the Dark Cloud Cover two-line pattern. 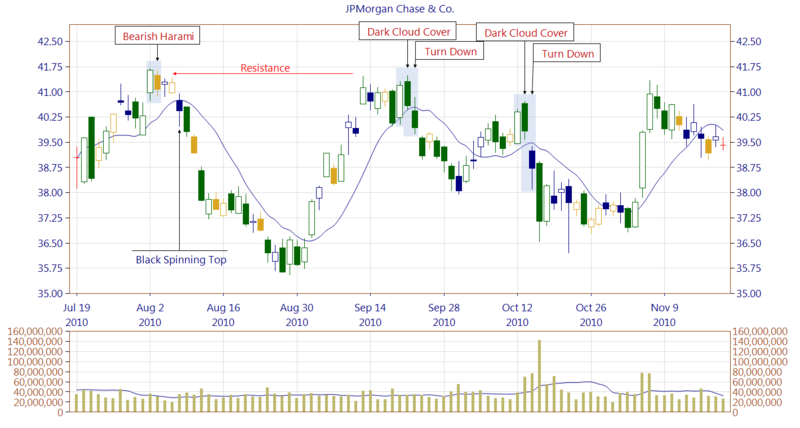 The Dark Cloud Cover is among the most popular candlestick patterns. Its first candle has to be a white candle appearing as a long line (White Candle, Long White Candle, White Marubozu, Opening White Marubozu or Closing White Marubozu). The second candle is a black candle appearing as a long line (Black Candle, Long Black Candle, Black Marubozu, Opening Black Marubozu or Closing Black Marubozu). The second candle's opening price should be above the prior candle's high. It is, however, acceptable that these two prices are equal (CandleScanner implements this that way). Closing of the second candle needs to be below the midpoint of the first candle, but not lower than its opening. 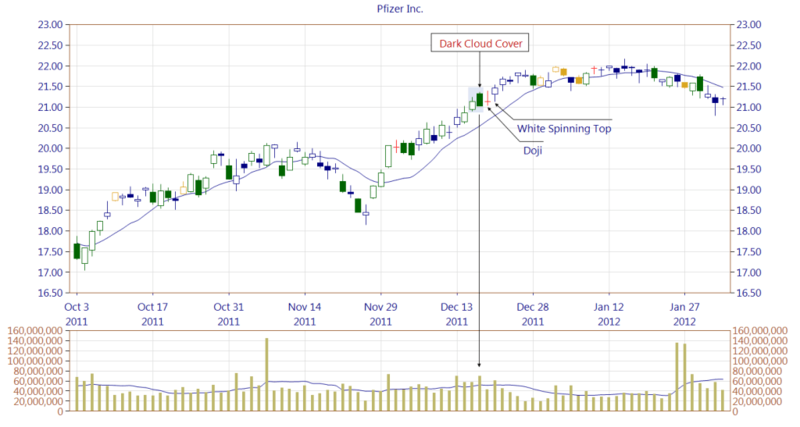 The Dark Cloud Cover is a classic bearish reversal pattern, which appears at the end of an uptrend. After definite increases, the second candle of the pattern opens creating a price gap, however, closes below the midpoint of the previous candle, proving the market weakness. Pattern's reliability is higher if the trading volume increases on the second line. As every other pattern, it should be confirmed by the following candles. Confirmation may be for example in the form of breaking a support level or a trend line. If the pattern managed to reverse an uptrend, its second candle creates a strong resistance zone. Figure 2. An occurrence of Bearish Harami is confirmed by a Black Spinning Top, which breaks a trendline and creates a resistance zone. The classic definition describing Dark Cloud Cover requires a price gap between the first and the second line (second's candle opening price above the previous candle's high). CandleScanner relaxes this condition allowing second's candle opening price to be equal to the previous candle's high because it increases the number of found patterns. Two lines of the Dark Cloud Cover need to appear as long lines which emphasize their power. The first line is bullish whereas the second although its opening is also very bullish, the overall black candle is very bearish. The first occurrence of Dark Cloud Cover stopped an uptrend exactly on the level of Bearish Harami. The Dark Cloud Cover is confirmed by the appearance of Turn Down pattern (breaking the trendline). The second line of Dark Cloud Cover forms a strong resistance zone. The second occurrence of Dark Cloud Cover is very similar being again confirmed by the presence of Turn Down pattern. The resistance zone created by the first Dark Cloud Cover pattern is working, stopping the market increase. Figure 3. In the analysis of the Figure 2., we have emphasized the importance of patterns confirmation. On the Figure 3., we can see a pattern occurrence, which the second line is formed at a significantly higher trading volume. However, the pattern appeared far above the trendline, and its confirmation is even more required. The market has to break the trendline after the pattern occurrence. We can notice the Doji candle, which indicates the market indecision. The following candle, White Spinning Top, cancels the Dark Cloud Cover pattern (closing price above the pattern's second line). 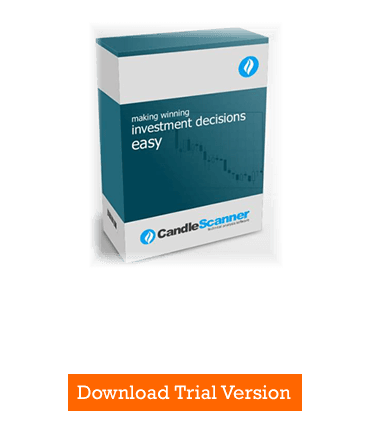 Below you can find some Dark Cloud Cover pattern statistics calculated by CandleScanner software. To see more detailed statistics, for other markets and periodicity try our CandleScanner software. Prices start at only $10, and you can see more detailed statistics, for other markets and periodicity. Click here to find out more!